"If it was falling on my house I would be dead for sure"
In this image made from video, police inspect the damage to a building from a rocket, Wednesday, Oct. 17, 2018, in Beersheba, Israel. The Israeli military says a rocket fired from Gaza made a direct hit on a home in southern Israel. 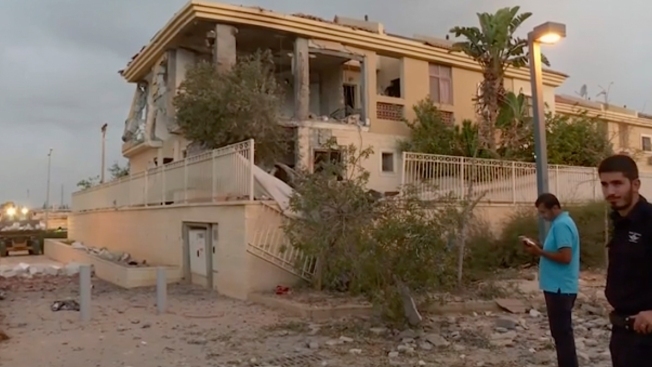 It’s the first rocket attack against Israel in months and the first that hit an Israeli home in Beersheba since the 2014 war between Israel and Gaza’s militant Hamas rulers. A rocket fired from Gaza struck a residential home in southern Israel early Wednesday and the Israeli military began attacking militant sites in Gaza in response after days of rising tensions. The Magen David Adom medical service said a woman and her three children, whose home in Beersheba was struck, were being treated for shock after they fled to their shelter upon being awoken by warning sirens shortly before 4 a.m. Her swift response likely saved their lives, as the home was destroyed and debris was scattered throughout the street, damaging parked cars and adjacent structures. Next-door neighbor Segev Naveh said he did not hear the warning sirens and was awoken by the massive blast. "It was very scary," he said. "If it was falling on my house I would be dead for sure." Lt. Col. Jonathan Conricus, a military spokesman, said 20 Hamas targets were struck, including offensive tunnels, weapon workshops and naval shafts. The military released video showing militants preparing to fire another rocket toward Israel before they were targeted. Beersheba, which is some 50 kilometers (30 miles) from Gaza, is the biggest city in southern Israel, with a population of around 200,000. In a rare move, seemingly aimed at easing the tensions, the "joint coordination room of resistance factions," which includes Hamas, Islamic Jihad and other groups, issued a statement distancing themselves from the rocket fire. The head of Egyptian intelligence, Abbas Kamel, is scheduled to visit Gaza this week to renew high-level cease-fire talks. Conricus, however, rejected the militants' denials, saying the rocket that struck Beersheba was a mid-range, locally produced weapon that was in the possession of only two groups: Hamas and Islamic Jihad. Regardless of who fired it, he said Israel holds Hamas responsible for all violence emanating from the territory it controls. "If it has any sense, Hamas will cease its fire and violent outbursts — now," he said Sunday.